The Not-So Austen Book Club: Join online @ Goodreads for more! Want to catch up on the latest? Like to participate in book discussions, challenges, polls and events? Love chatting with fellow book obsessors? Do all this and more at the Not So Austen Bookclub! But don't stay here! 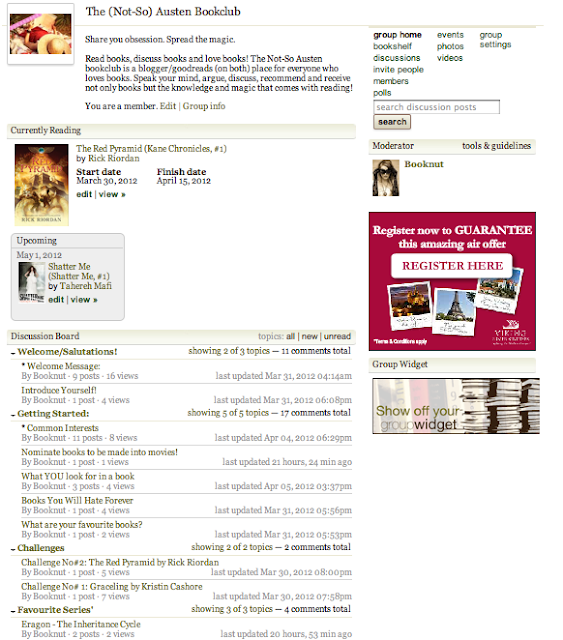 All the action is @ Goodreads! 24/7 updates and related activities, best boom quotes, games and more - this group has it all! With 49 members and counting, this group is the group for all you 21st century bookworms. We have an external blog? How have I missed that we have a blog. Awesome!